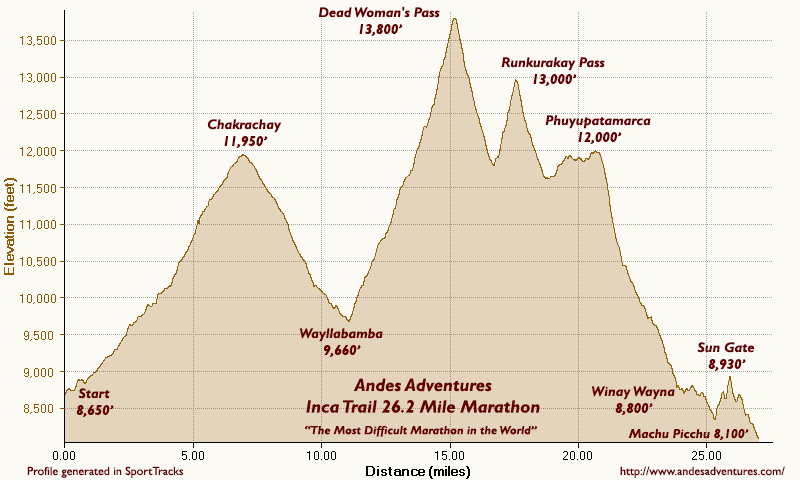 Andes Adventures 26.2 mile Inca Trail Marathon to Machu Picchu elevation profile. Elevations have been corrected using SRTM 3" Viewfinder Panorama elevation data. The cumulative elevation gain is conservatively calculated to be over 10,400', and the elevation loss over 11,000'. The elevation gain/loss is like running up and down the stairs of the Empire State Building 10 times – at an altitude as high as 13,800 feet! The Inca Trail Classic 30K to Machu Picchu is run at the same time.